MySQL HA 有幾種選擇 MHA、MMM、Keepalived、Heartbeat、Pacemaker ..
$ drbdadm create-md meta initializing activity log NOT initializing bitmap Writing meta data... New drbd meta data block successfully created. # 警告mysql-node1已死 heartbeat: : WARN: node mysql-node1: is dead # 由於mysql-node1已死，所以mysql-node1已經放棄resources heartbeat: : info: Dead node mysql-node1 gave up resources. # 最後確認mysql-node1死亡 ipfail: : info: Status update: Node mysql-node1 now has status dead # mysql-node1 eth0 死亡 heartbeat: : info: Link mysql-node1:eth0 dead. # ipfail 偵測到 slave 還活著!!! ipfail: : info: NS: We are still alive! # ipfail 進行狀態更新 ipfail: : info: Link Status update: Link mysql-node1:eth0 now has status dead ipfail: : info: Asking other side for ping node count. ipfail: : info: Checking remote count of ping nodes. 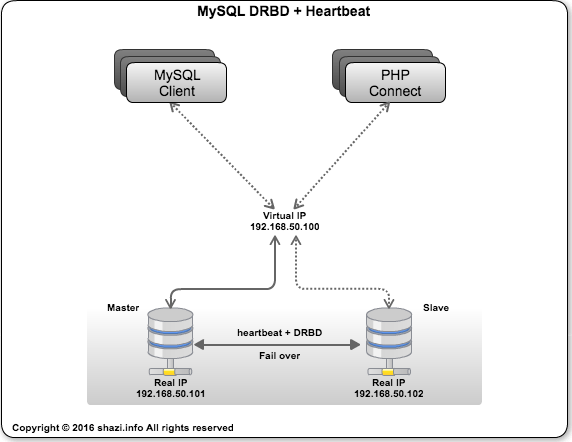 heartbeat: : info: Dead node mysql-node1 gave up resources. heartbeat: : info: Link mysql-node1:eth0 dead. # ipfail 偵測到 slave 還活著!!! ipfail: : info: NS: We are still alive! ipfail: : info: Asking other side for ping node count. ipfail: : info: Checking remote count of ping nodes. # mysql-node1 偵測到上線 heartbeat: : info: Link mysql-node1:eth0 up. # mysql-node1 更新狀態初始化 heartbeat: : info: Status update for node mysql-node1 : status init # ipfail 又出場更新狀態了 ipfail: : info: Link Status update: Link mysql-node1:eth0 now has status up heartbeat: : info: all clients are now paused ipfail: : info: Status update: Node mysql-node1 now has status active heartbeat: : info: remote resource transition completed. heartbeat: : info: all clients are now resumed ipfail: : info: Asking other side for ping node count. ipfail: : info: No giveup timer to abort. heartbeat: : info: Link mysql-node1:eth0 up. heartbeat: : info: remote resource transition completed. ipfail: : info: No giveup timer to abort.